ChiIL out with ChiIL Mama and learn how to keep your kids safe on line with a series of free, fun, comic style videos you can watch together. Use the #GrowingUpOnline Blog App and download the free eBook for a chance to win a copy of THE LORAX on DVD & Blu-ray! Disclosure: We've been given a copy of The Lorax Blu-Ray for our readers in exchange for spreading the word about Growing Up Online. Our kids have never known a world without the Internet. They’re spending more and more time on the web, so teaching them about using technology responsibly and safely is critical. DOWNLOAD THE FREE eBOOK on internet safety for a chance to win! Enter through midnight October 2nd, 2013. Click the Rafflecopter link below to enter. We live in an exciting new world of sharing information, more so than ever before, but this is not without its challenges! Many of us have heard about or experienced “cyber-bullying.” We know the pain it can create. Far too often have we heard the stories of children being cyber-bullied who don’t know what to do or where to turn. 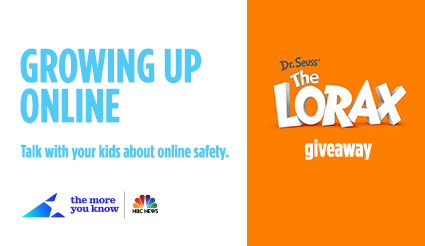 The More You Know Learning Series, in collaboration with NBC News, addresses this new and dangerous trend, in addition to other online issues, with the launch of Growing Up Online, the FREE eBook for parents to keep their kids safe on the Internet! You and your family can now be prepared, clued-up and openly communicative about online issues big or small! Download the FREE Growing Up Online eBook and be sure to watch all four entertaining comic book stories as a family. These stories show real situations that may occur when your kids go online. This free eBook provides easy-to-use information that addresses the growing concern about kids’ online privacy and cyber-bullying in a unique and engaging way. Growing Up Online is packed with important tips that every parent should know! • Download the FREE eBook for a chance to win! • Share your most important tip or piece of advice from the free eBook. • Share how you personally talked to your kids about the Internet and being safe online. • Tweet using the #GrowingUpOnline hashtag to let your audience know that your children are surfing the web safely! • Share on Facebook, Pinterest, Twitter or Tumblr to drive traffic to your site! Tip #2- Place Limits on How Long Your Children Can be Online, is my favorite! I make sure they don't give out personal info.